Only a small part of the energy an organism obtains is transferred to the next consumer in a food chain. Thus, many more organisms have to be at the base of a food chain than at the top of a food chain. 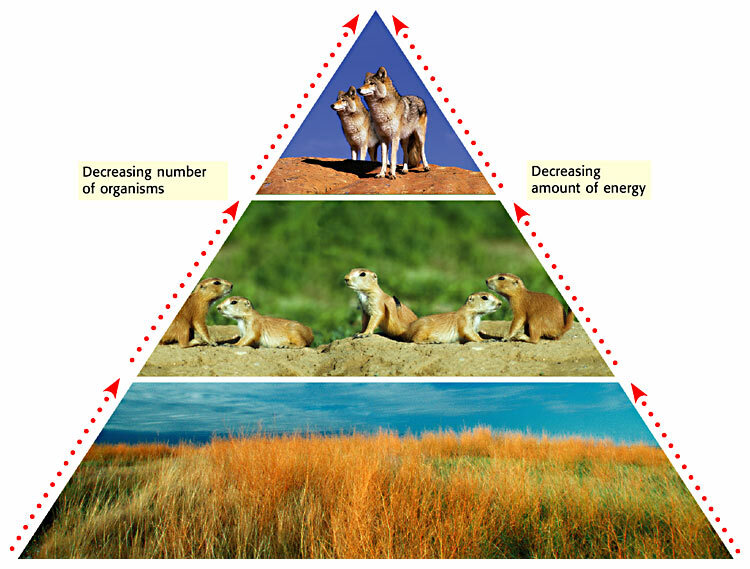 For example, in a prairie community, there must be more grass than prairie dogs and more prairie dogs than coyotes. The amount of energy at each level of a food chain can be seen in an energy pyramid. An energy pyramid is a diagram that shows an ecosystem’s loss of energy. Only about 10% of the energy in each level of the energy pyramid is transferred to the next level of the pyramid. An example of an energy pyramid is shown in Figure 4 (to the left). You can see that the energy pyramid has a large base and a small top. Less energy is available at higher levels of the pyramid because most of the energy has already been used at the lower levels.